The most important causes for coral reef degradation are coastal development and excessive exploitation of its resources. Migration towards coasts led to strong development on land, which often lead to destruction of important coastal ecosystems like mangroves and sea grass beds. Uncontrolled building and development on the coast, e.g. hotels, factories and desalination plants, have led to an increased erosion on land and subsequent sedimentation in the surrounding waters. Increased sediments in the water cause a decrease in the amount of light that penetrates the water column. Enough light is crucial for the survival of corals and algae. Untreated discharge water and agricultural run-off (containing a.o. pesticides, herbicides and fertilizers) place a great burden on the nutrient cycles in coastal zones, which can lead to eutrophication (over-fertilization), algal blooms and depletion of oxygen. Overfishing and the use of destructive fishing methods have decimated fish populations on reefs and destroyed their habitats as well. Additionally, elevated surface temperatures caused by worldwide climate change lead to coral bleaching more frequently. Ocean acidification (caused by increased amounts of CO2 in the atmosphere) have adverse effects on the growth rates of corals, by making it harder for them to build and maintain a stable skeleton. These processes will endanger the lives of millions of people dependent on reefs for food and income. Most of these people live in developing countries. A good reef management is costly, but the losses will become much larger if we fail to take action now. Unsustainable and excessive forms of tourism have disastrous consequences for reefs, on which they ironically depend the most. The income flow in reef areas is threatened by reef degradation. 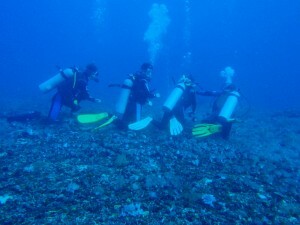 The damage on reef is often caused by increased tourism. This is facilitated by uncontrolled building and irresponsible business operations, increased discharge of wastewater and incautious behavior of tourists themselves. Mass tourism is a threat to coral reefs and with them the income the reefs provide for the local public. Sustainable tourism, on the other hand, is a source of income for all activities related to tourism. It additionally provides an alternative for destructive fisheries in the local communities. The most important human impacts related to mass tourism are among others increased sedimentation, loss of habitat, and discharge of garbage and wastewater. This leads among others to increased turbidity which can bring the amount of light available for coral growth and survival below a critical threshold. Besides these, direct actions also have impacts on reef systems. Corals get damaged and may even die when they come in contact with fins, hands, knees, boats or anchors. Photo: a tourist is walking on live coral (by Marc Kochzius). 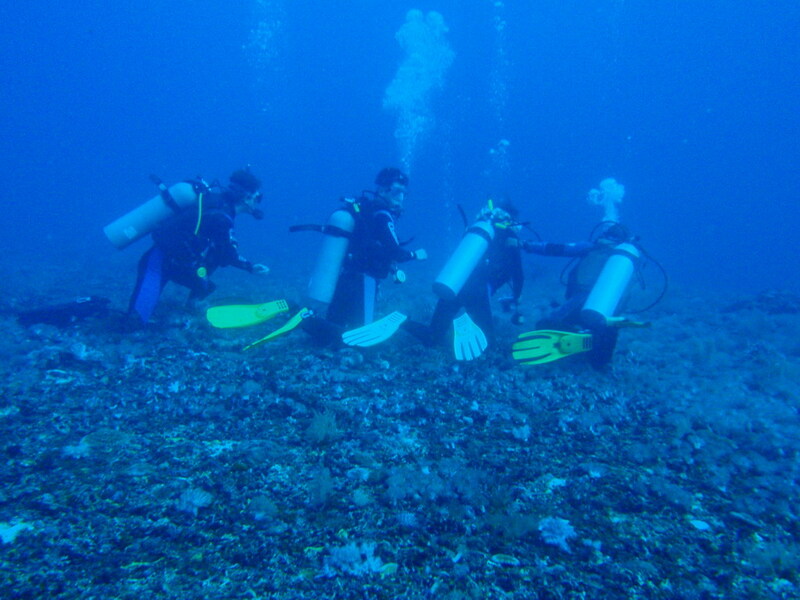 Photo: divers are sitting on corals, waiting for thresher sharks at Malapascua, Philippines. Many boats with snorkelers or divers anchor inside reefs. Every time this happens, some corals will break. 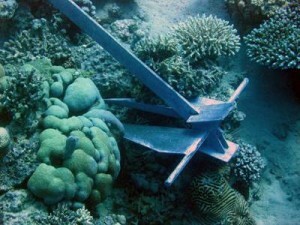 Photo: anchor in several corals. 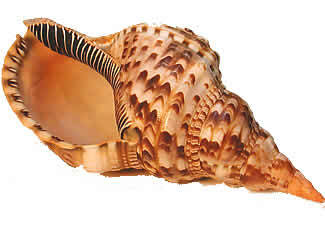 Tourists like to buy souvenirs for friends and family, for example shells like the nice Giant Triton in the photo below. The animal that lived in this shell is a natural enemy of the crown-of-thorns starfish. The reduction in numbers of the Giant Triton disrupts a natural balance which causes the crown-of-thorns starfish to increase its number. And sadly, this starfish preys on corals. Photo: Giant Triton (Charonia tritonis). 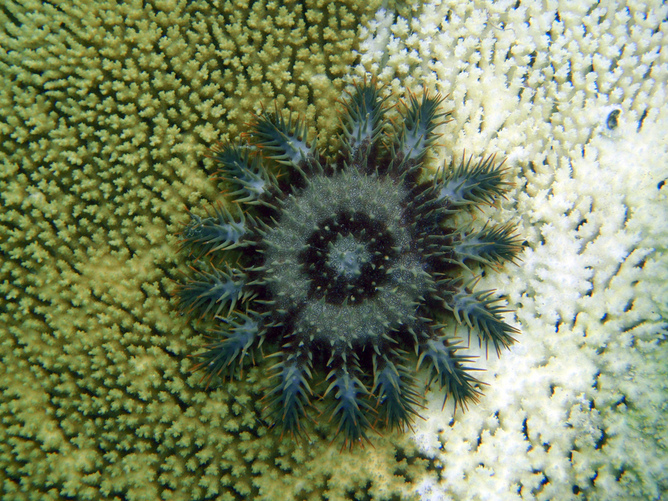 Photo: on the right a coral eaten by a crown-of-thorns starfish (Acanthaster planci). Overfishing and destructive fishing methods lead to damage to both fish stocks and their environment. The problems include dynamite- and cyanide fishing and trawling. Explosions from dynamite fishing shatter stony corals and kill fish and invertebrates (including corals) in a large radius. After some time a whole reef is damaged. The habitats of the target fish and the fishermens’ catches are thus destroyed. 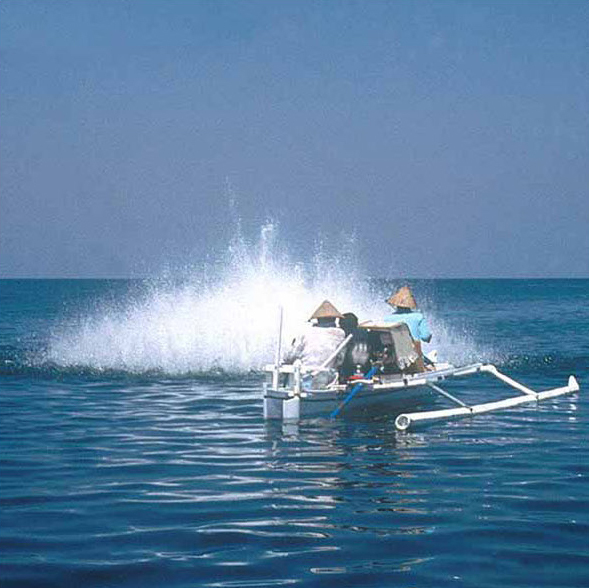 Photo: Dynamite fisheries in Indonesia (by Lida Pet-Soede). Cyanide fisheries use cyanide in concentrations that are not meant to kill, but just paralyze fish so that they are more easily caught. Cyanide is injected in holes in the reefs and often corals are broken off in the process of reaching a fish’s hiding place. These actions cause a lot of stress in corals and the cyanide kills many smaller reef organisms who are more vulnerable to overdoses. Corals that are repeatedly exposed to cyanide die. Cyanide fisheries also supply some live fish for the aquaria-trade. Fishing nets often get stuck in reefs and damage them. Fishermen frequently cut those nets loose from their boats and leave them behind. The nets continue to damage corals and catch fish, something that is called ghost-fishing. 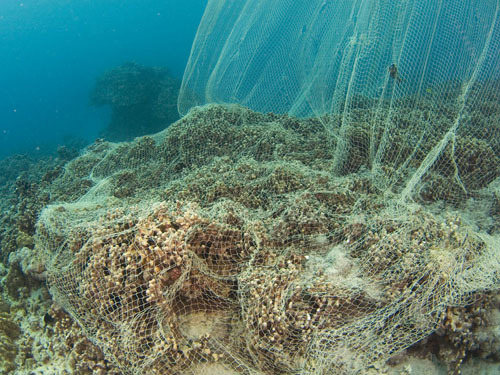 Photo: nets damaging coral reefs. Discharge and pollution originating on land, e.g. industrial waste, household garbage, agricultural sources and forestry cause great damage to reefs. Sedimentation by dredging and nutrients in run-off water lead to a higher turbidity in the water column, which prevents corals from catching the sunlight they need to grow and survive. Sunlight is essential for photosynthesis, the primary source of energy and food for corals and plants. Compared to the acute stress caused by destructive fishing, chronic stress by sedimentation leads to a slow reduction of a reef’s health. 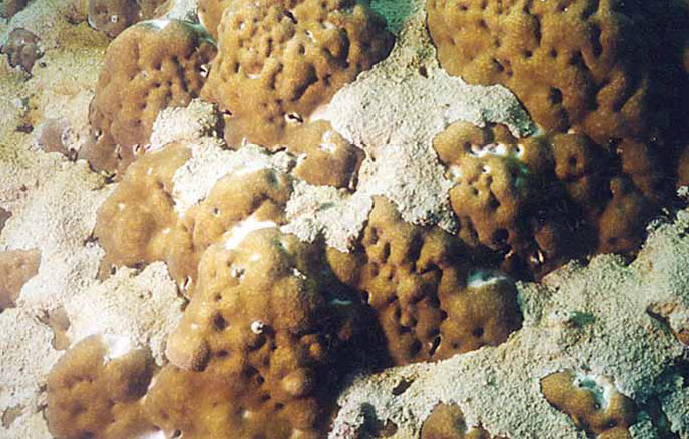 It hinders the growth and makes corals more vulnerable to disease. Nutrient enrichment can tip the balance in an ecosystem by stimulation the growth of phytoplankton (a.o. algae) that can float freely in the water column. 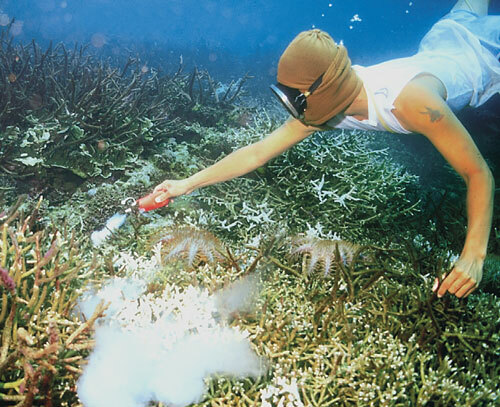 Additionally it can stimulate the growth of seaweeds (plant-like algae) which can overgrow the slower growing corals. Corals, unlike most seaweeds, are highly adapted to the low nutrient levels typically found in tropical seas. 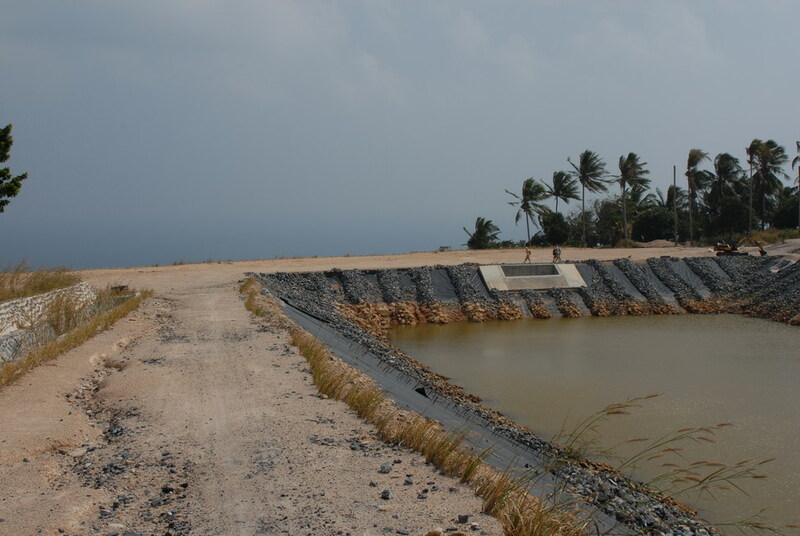 An example: in Koh Tao (Thailand), a fresh water basin was build. More trees were removed than was necessary for this basin. During the rainy season roots no longer held the rain water and this water run off into the bay downhill, taking sand and dirt with it. 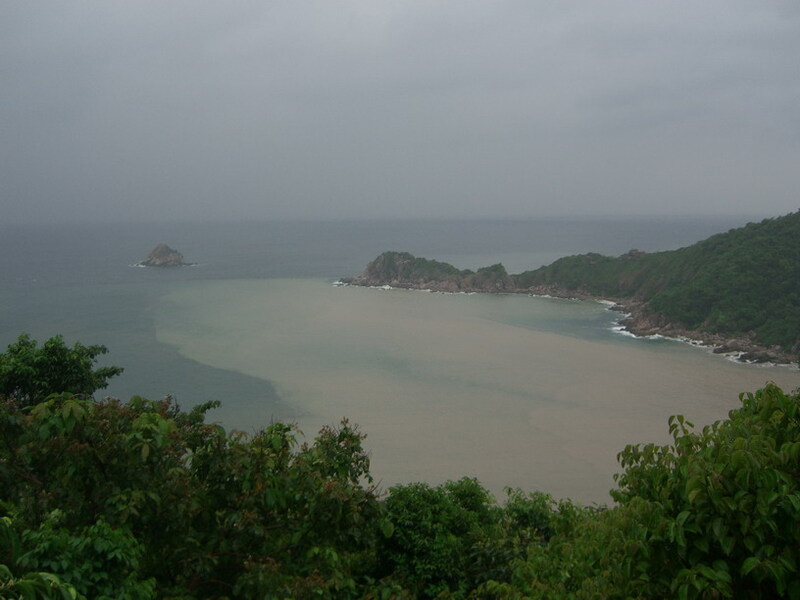 The run-off deposited 1.5m of sediment in the bay on top of the reef, suffocating it. Before the basin was build, coral covered 80% of the bay. After the erosion only 30% cover was left. Photo: fresh water basin (by Frank van Klaveren). 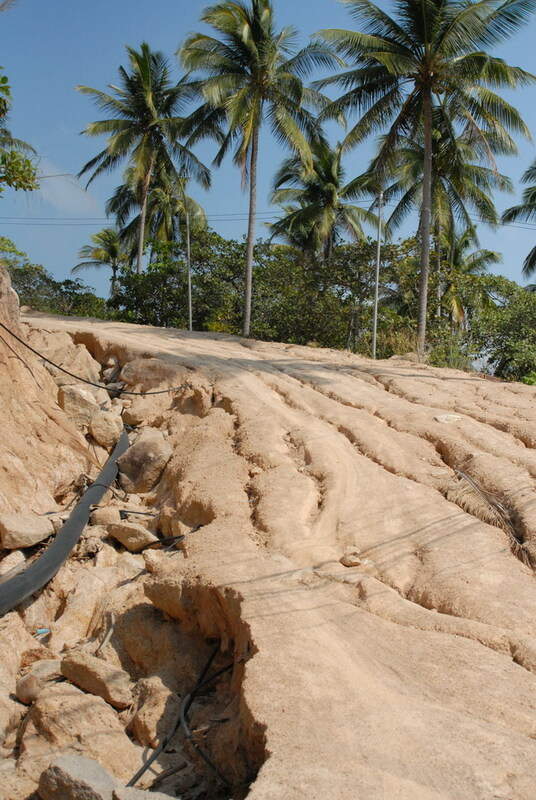 Photo: erosion visible on land Photo: run-off with sediment streams into the bay. Photo: sedimentation on the reefs (by Ross Jones). Pollution on land will eventually end up in the ocean and damage marine life. The production of waste increases. Besides abandoning it at sea, on the beach or in the street, waste also ends up in sea by the wind or run-off from both legal and illegal dumps. Plastics encompass most of the waste and degrade slowly. 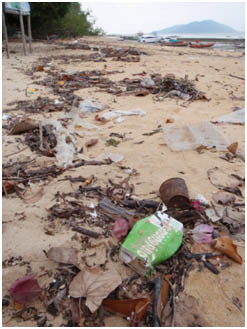 Photo: waste and garbage on a beach. 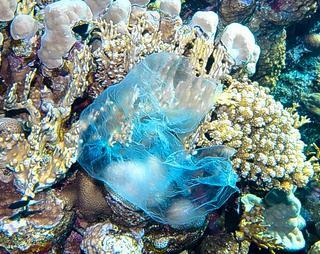 Photo: a plastic bag covers and damages a coral. Climate change, and in particular the associated effects of coral bleaching, is an important threat for the future of coral reefs. 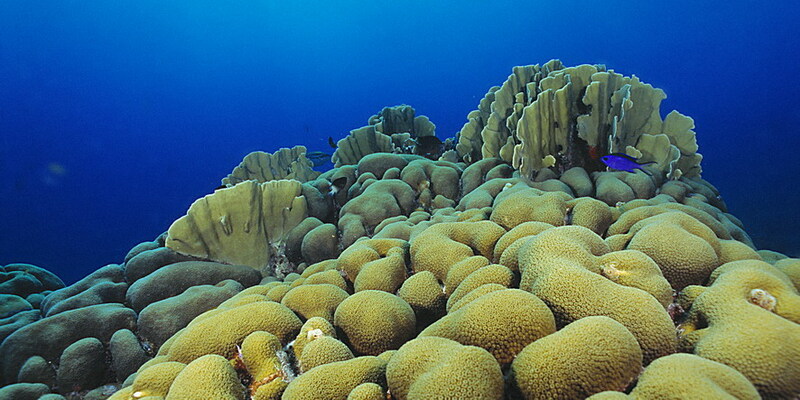 Corals and many other reef organisms are dependent on a symbiosis with algae living inside their polyps. These algae provide up to 95% of the energy a coral needs to grow, reproduce and feed itself. They are called zooxanthellae and are what gives corals their nice colors. When a coral colony is under stress, the algae are expelled and the white coral skeleton becomes visible through the coral’s translucent tissue. This gives the coral a bleached appearance, hence the name “coral bleaching.” If the conditions improve and the source of stress is taken away, affected corals can slowly recover because the zooxanthellae return. However, this recovery is heavily dependent on the exposure time and intensity of the stress factor. A longer period of stress, about a month, increases the chance of the coral colony dying. 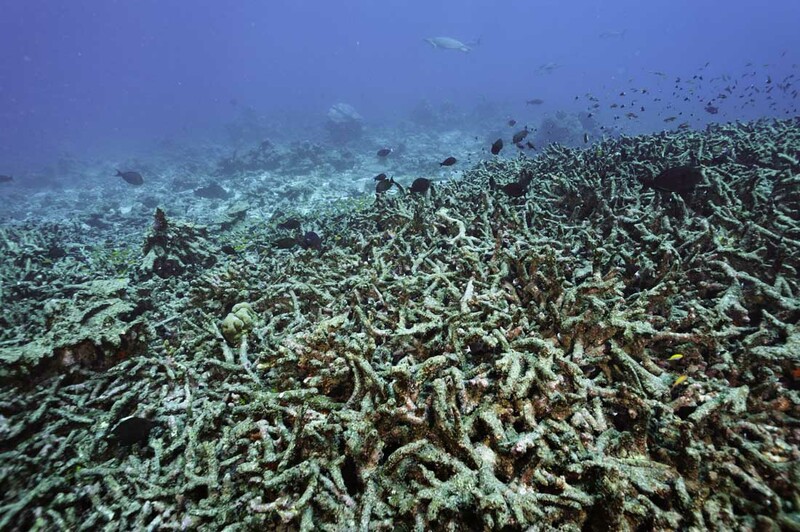 The mass bleaching of corals in 1998 was by far the most intense and widespread event. 16% of all reefs around the world were destroyed. The water temperature increased above the average by the El Niño event of 1998. 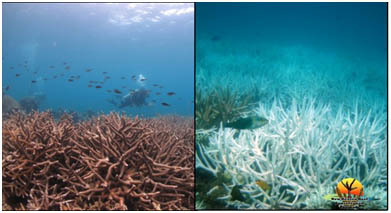 The Great Barrier Reef on the north-eastern coast of Australia experienced two periods of massive bleaching in 1998 and 2002. Most reefs recovered quite well, but the mortality of some reefs on other locations was well over 90%. 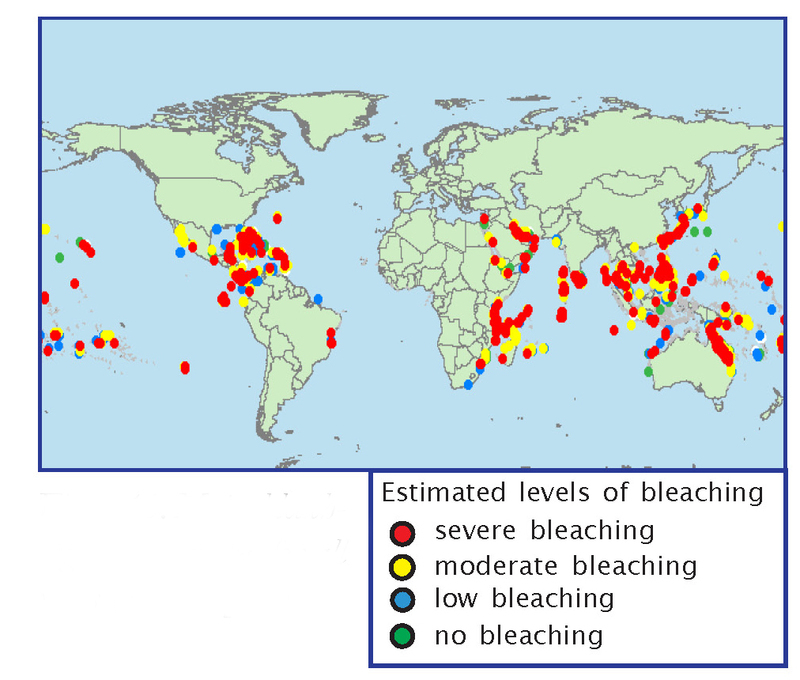 Coral bleaching was observed only a few times before 1980. After 1980 quite some bleaching events have been observed and predictions say that we can expect such an event every 2-4 years. Climate change causes ocean acidification and a rise of both the water temperature and level. Ocean acidification is the continues decrease of the pH (acidity) of ocean, caused by the intake of carbondioxide (CO2) from the atmosphere. It is estimated that over 50% of all the CO2 released into the atmosphere will dissolve into oceans, rivers and lakes. Acidification can cause the skeletons of corals, mollusks and crustaceans to dissolve. Some species are already known to be unable to build a skeleton anymore. Acidification became visible after our Industrial Revolution. Recent studies point out that the rate of acidification increases to this day. Photo: a healthy reef (left) and a bleached reef (right) (by New Heaven Dive School). 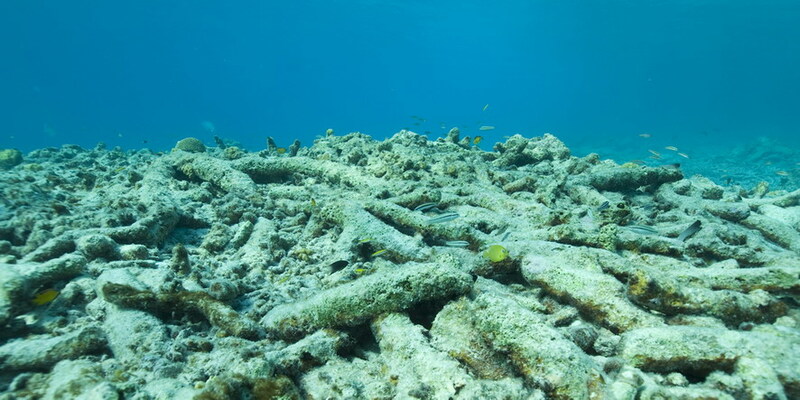 When a coral is dead, the skeleton will erode into smaller pieces of rubble and eventually turn into sand. The original functions of habitat for fish and other marine organisms, coastal protection and attractive dive site will be lost. Photo: reef eroded to rubble (by unknown). 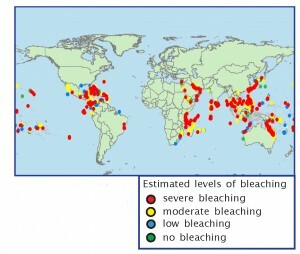 Picture: important bleaching events in the past years. Local threats to coral reefs reduce the capacity of reefs to resist global threats.